Each piece is identified by a numbered stamp on the bottom. This item is part of a limited edition, numbered series. Includes a biography on the artist and a certificate of authenticity. Size (inches): 16.34" X 8.66" X 8.27"
The Story of "Le Taxi!" On a very hot day, Miss Marta Gaitan Barberio and her friend Mercedes Arana Calderon decided, after a long trip by train, to go home by cab. 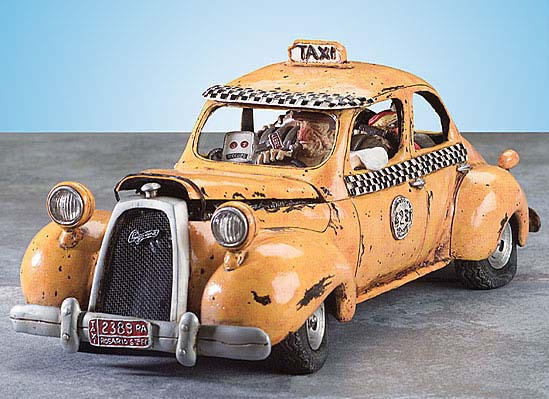 The taxi was an old model and rather badly kept up; the body was all beat up and held together with iron wire. The driver of the completely demolished vehicle wouldn't let the ladies put their luggage in the trunk because it was already filled with six packages of sausages, barbecued ham, and three cartons of beer. He wouldn't let them put their belongings on the front seat either, because he didn't want it ruined. Once they got home, Marta and Mercedes had to ask a passerby to help them squeeze out of the car. From the early 1980's, Guillermo Forchino experimented with various materials to create works of art in volume. This research began at the Ecole des Beaux-Arts in Rosario, Argentina and then continued with three years of studies in art restoration and conservation at the Sorbonne University in Paris, France. During his studies he discovered and mastered classic techniques and materials. After completing his studies in Paris, he returned to Argentina where he directed the Juan B. Castagnino atelier of art restoration for the Museum of Beaux-Arts of Rosario. It was during this period that Forchino began creating figures made from wrapped bands of cloth where the visible parts of the body (head and hands) were made from wax and paper maché colored with natural pigments. From the end of the 1980's, Forchino chose poly resins to create figures and scenes that resemble the world of comic strip and cartoon characters. They are typically unusual and humorous subjects such as a family leaving on vacation in an overloaded car with flat tires or a tired, old pick-up truck from the 1950's. He has used other modes of transportation such as boats, planes and motorcycles and has even used a bathtub for a military dictator. His characters are always handled with humor and finesse and given a soul. He has had regular expositions in France and in Argentina. Guillermo Forchino lives and works in Paris in his workshop two steps away from the Père Lachaise cemetery. The Comic Art of Guillermo Forchino is now available for a larger group of art lovers in the form of limited edition, numbered series. Found only in specially selected stores, each piece is identified by a numbered stamp on the bottom. It comes wrapped in the newspaper "The Forchino Times" along with the autobiography of Forchino and pictures of his collection. A certificate of authenticity completes the package.